For many years, camping has been the average American citizen’s go-to escape from the trials of daily life. As technology advances and jobs get progressively more stationary and sedentary, it gets harder each day to take time off and unwind from the pressure of a working life. As it turns out, today, more than ever, camping is still one of the best getaways - for both yourself and your family - to take a break from the monotony of city life and relax in the boundless treasures that nature has to offer. Gathering firewood, building a campfire, and cooking your own food beneath a roof of stars are just a few of the tasks you’ll get to do when camping. Admittedly, while these may come off as annoying chores for those that have never camped before, the fact that you’re doing this with a backdrop of stars, and with an equally impressive landscape surrounding you, more than makes up for any chores you may have to perform in order to get by in this situation. If anything, camping is the perfect method for getting away and creating fond memories with your all your loved ones; friends and family alike. However, if you decide to give camping a try, you need to know that you’ll require a set of items, all of which are meant to ensure your wellbeing when traversing the vast wilderness. Depending on the type of camping you’ll be doing, you will need to invest more or less money in order to guarantee your safety in your camping spot. Nowadays, there are designated camping spots in quite a number of locations in the United States, most of which come with their respective tent pads, as well as other necessary elements, such as a stove, and seating areas such as a table and benches. While these commodities can actually make camping a much simpler ordeal - especially for the uninitiated - they can sometimes take away from the overall experience by facilitating all the tasks that the camper had to perform by himself in times past. However, regardless of your camping spot and the amenities it offers, the single most important part of your camping trip - especially if you’re camping with family or friends - is, by far, the tent you will opt to use. Without going too much into specifics just yet, your tent will be, quite literally, the center of your operation during the camping trip. Regardless of whether you’re planning an overnight trip to the campsite, or simply an afternoon in the surrounding countryside, your tent will be the main provider of shelter and comfort during your stay. Consequently, a considerable amount of thought and effort should go to the task of acquiring a tent that’s suited to the task, as well as able to stand the test of time. Unfortunately, most manufacturers are content on overselling their products, or equipping them with features that you won’t ever actually need to use, making you waste more money in the process. This makes the process of choosing a right tent a bit of a challenging ordeal, especially if you don’t actually know what to look for in a tent. This article was created to help out the budding hikers and campers in finding a tent that is best suited to their requirements so that they may enjoy their camping trips to the fullest without having to worry about setting up unintuitive tents, or whether they’re gonna be able to squeeze into their temporary shelter throughout the night. But before we get into our top picks for best instant tents, we need to go over several things that you should keep in mind when browsing the market for one of these products. With these elements in mind, even if you don’t find a tent to your liking in our list, you will still be able to browse different options on your own, and make the very best decision, which will help you save lots of money and time in the long run. Starting off our list with a big beach tent, perfect for those trips south to any of our finest beaches. Beach tents are not meant for overnight stays; instead, they are designed to provide shelter from the sun during those trips to the beach. This one in particular features Pacific Breeze’s patented EasyUp Hub System, which is an industry leader when it comes to pitching tents. This beach tent can be both assembled and put down in a matter of seconds, even without prior knowledge of how to set up a tent. 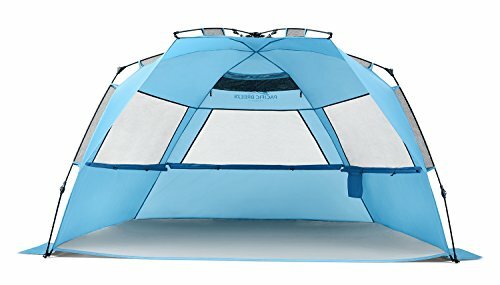 This beach tent is very lightweight, weighing just over 6 pounds, and is big enough to accommodate 3 to 4 people. The interior is lined with several pockets for storing everything from water bottles to sunblock, books, and other objects. The frame is supported by fiberglass poles, which makes it very sturdy and durable. Despite being lightweight, this tent is equipped to withstand the harsh winds of the coast thanks to its 5 sand pockets which, when filled with sand, provide the tent with enough weight to remain firmly planted. 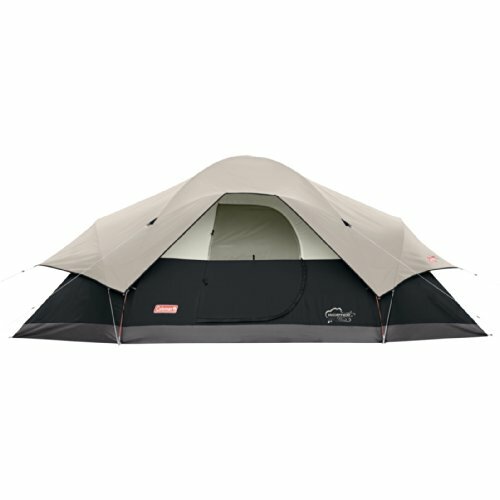 This is one of Coleman’s more standard models of dome tents. It features anything you’d expect from a product of this type at a very affordable price. The obvious tradeoff comes in the form of less utility, at least when compared to other products; what you see is what you get. This tent is big enough to fit a big air mattress, or a pair of sleeping bags, which makes it ideal for 2 people, while still allowing enough space to store their gear as well. 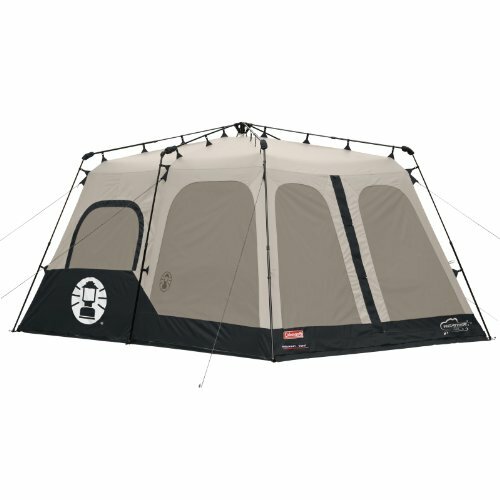 This tent comes with its own rain fly, which makes it 33% more waterproof than other Coleman tents. Furthermore, it comes with 2 windows which can be unzipped to increase ventilation, while keeping bugs and other undesirables away. As we mentioned above, the products from CORE equipment are designed to amplify the user’s enjoyment of the great outdoors. In the case of this tent, it does so by providing a shelter for up to 4 people, which can be put together in as fast as 30 seconds, so that the campers can focus more on enjoying the trip than dealing with pesky and unintuitive tent mechanisms. All CORE tents are equipped with the patented H2O Block Technology, which adds a layer of waterproofing to the tent while allowing them to keep fresh enough, thanks to the adjustable ground vent. The result is a tent which can provide an effective shelter 3 out of 4 seasons. This tent is equipped with a lantern hook in case you want to add a light source to its interior, and with plenty of pockets to keep your gear organized within, without having them littered all across the floor. The big brother to the 4 person tent mentioned above. This one can fit two queen-sized air mattresses and can accommodate up to 9 individuals inside. 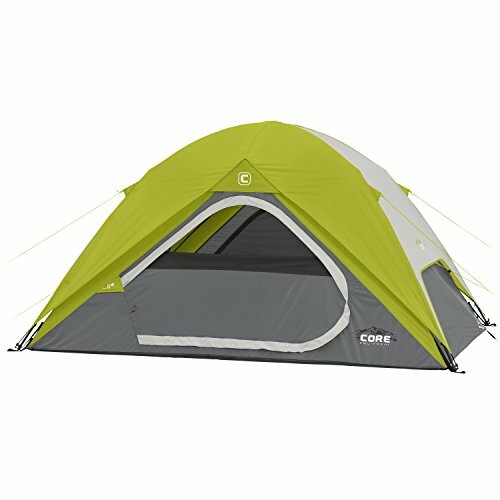 Besides the difference in size, this tent comes equipped with similar features to the CORE 4 above, with the notable difference of having a room divider. 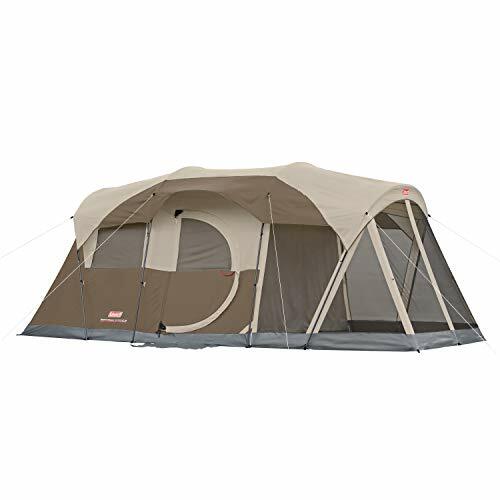 This one is similar to our second entry, the Sundome 2, with the sole difference being the size of the tent in question, which can accommodate 4 individuals instead of 2. Other than that, this tent can also be set up in less than a minute and is made out of polyethylene fabric on top of a fiberglass frame. 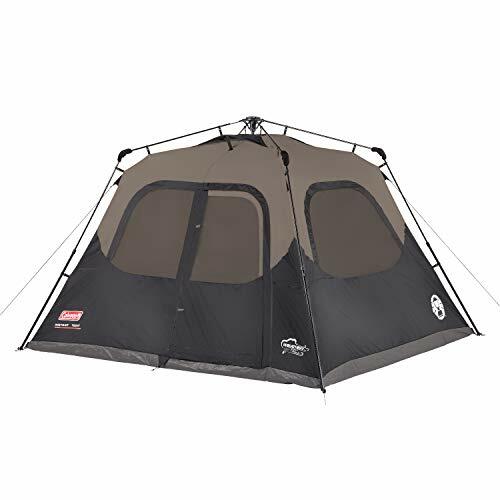 Like the Sundome 2, this tent is also part of Coleman’s budget tents for campers that are looking for spend a comfortable night outdoors but don’t want to break the bank in the process. Climbing up to Coleman’s tents for bigger families, this tent can easily accommodate up to 6 people within, while leaving plenty of space for their gear and backpacks. Furthermore, it has plenty of windows which can be opened or closed to control the amount of ventilation within the tent. In true instant tent fashion, this product can be easily assembled and dismantled in less than 60 seconds each. This is the first tunnel variant in this list, which consists of 2 rooms with a “front porch” of sorts which can be used to leave muddy boots, equipment, and other gear which can stain the interior of the tent. Besides the dual-bedroom setup, the Coleman instant tent is also equipped with a protected storage space, so that anyone can store their valuables and not have them littered across the tent floor. Like the Easy Up Beach Tent mentioned above, this product offers a slightly cheaper alternative for a beach tent, with a different form factor. The Push Up Instant Beach Tent is easily deployed, just like an umbrella, with no need to twist and turn any poles or straps. After laying the tent down on the floor, all you need to do is push up the central connection, and the tent will instantly deploy in a matter seconds. 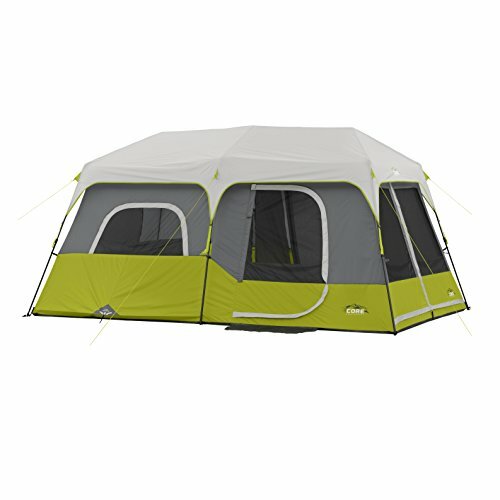 Like the 6-person screened tent above, this product by Coleman also consists of 2 bedrooms, with its respective divider. The only difference is that this one is big enough to accommodate 2 queen size mattresses, as well as 2 big sleeping bags. The height of this cabin tent is 6 feet, 5 inches, which means that most people will be able to stand up straight and walk inside with ease. 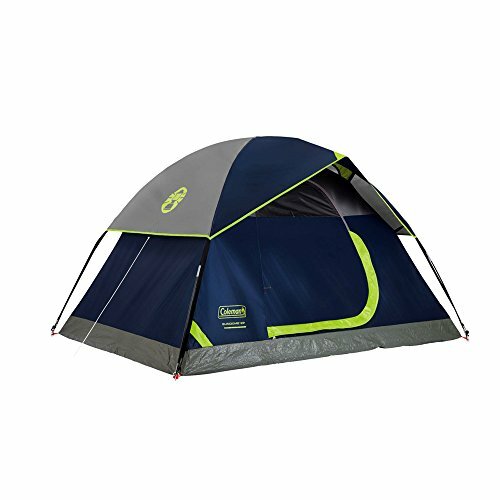 As its name suggests, this tent is also made to accommodate 8 individuals, but this one offers a different form factor than other models in this list. This one is more akin to an elongated dome tent, rather than a cabin tent, which allows it to adopt a more aerodynamic shape to better withstand strong gusts and winds while compromising on shoulder and head space. 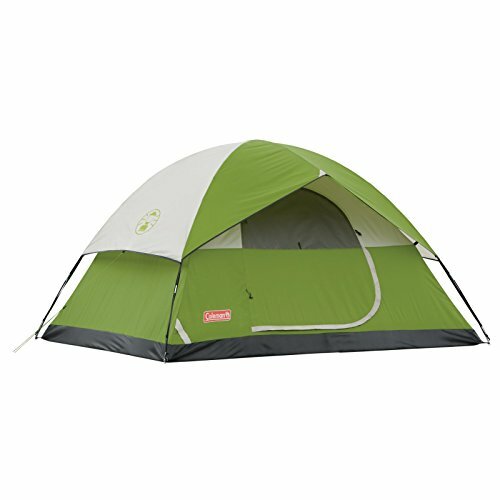 This tent is ideal for those families that are looking to set up camp on grasslands, or other places with windy climes. When it comes to buying a good tent, an easy way to find a product suited to your needs would be to simply fork over a couple hundred bucks, and buy the best tent available for purchase. However, as effective as this method may be, it’s definitely not the most efficient, especially if you’re running on a tight budget, and can’t afford to invest in more than you actually need. If this is your case, then you need to consider every single variable about the camping trip in order to make the very best purchase, so that you can effectively cover every requirement while avoiding overspending on a product you won’t actually need. The following are the most common elements you’ll need to keep in mind when browsing the market for good camping tents. First and foremost, you will want to analyze the type of camping trip you’re planning on undertaking. Is it a family vacation to the lake? Will you be driving to the campsite and setting up there? Or is it an expedition with friends, with possibly lots of hiking and backpacking? Depending on the type of situation, your type of tent will obviously vary. If you are driving to the campsite, then you should prioritize size and utility over portability and being lightweight, since your car will be doing most of the transporting. However, if you’re going backpacking with your friends and will have to hike considerable amounts of distance every day, then you’ll be better off buying a tent that is both small and lightweight. If you’re going expeditioning, which is similar to regular hiking but with usually harsher weather and terrain, you will need a tent that can withstand both the merciless weather and can offer better insulation than regular tents, so you can keep warm during those chilly nights. Expedition tents are usually heavy, with a few exceptions, so you will likely need to carry the weight regardless. Planning a camping trip can be somewhat tricky, especially if you have a family. The constant clashing of work schedules with school assignments can make finding a good date a near impossible task. Oftentimes, we will find ourselves planning family vacations a few months ahead, just so we can make time to spend together as a family. If this is your case, you will need to also consider the season in which you’re planning to camp in, as you will need a tent suited to the weather conditions you will be facing. As we mentioned above, tents can come suited for a single season, three seasons, four seasons, and even for expeditioning. The safest option you can choose when it comes to seasons is the four season tents, though these can get a bit hot during the summer. Furthermore, they’re also worth a pretty penny. If you’re going to camp in the spring, and are not looking to spend much on a camping tent, then you’ll be better off investing in a single season tent. These tents can provide sufficient insulation to withstand the chilly spring night time and, with the use of a rain fly, you can also keep dry during those occasional rainfalls. You can forget about camping during autumn or winter with a single season tent, though, as the downpours can make the tent buckle under the weight of the water and snow, respectively. Furthermore, these tents don’t offer nearly enough insulation to weather the cold autumn nights, and not to mention the even colder winter nights. If you want a tent that can serve you well during most of the year, your best bet will be to invest in a three season tent. Like the four season tents, they can get a bit hot in summer, but they can provide reliable shelter from the elements during rainy seasons, monsoons, and even light snowfalls. This factor goes in direct reference to the first one. Depending on the purpose of your trip, you might need to invest in either a lightweight and barebones tent or a large and heavy tent, laden with tons of utility value. If you are going backpacking, opt to buy the lightest tent possible, given that you’ll be lugging it on your back for the most part. On the other hand, if you’re going to use your car to drive to the campsite and set up there, then you can afford to get the biggest, heaviest tent you can buy since your car will be doing most of the heavy lifting. As we mentioned above, there are a wide variety of shapes of tents, all with their pros and cons. For starters, we have the dome tent, which is one of the most widespread form factors, mostly due to its ruggedness and remarkable resistance to the wind. With a rain fly in place, these tents can also provide an awesome waterproofing factor. Next up are the A-Type tents, also known as ridge tents. These tents offer less head and elbow space than dome tents, but their sloped roof makes them perfect for those that are expecting considerable rainfall during their trip. There are modified A-Types in the market that are equipped with a hood or center hoop pole, with can be used to amplify the shoulder and head space, making them almost as spacious as a dome tent, with the added benefit of awesome waterproofing. Tunnel tents, on the other hand, are like the specialists of camping equipment. They have very specific setup requirements, which takes into consideration the type of terrain, as well as the weather conditions of the area. Furthermore, these tents always have to be pegged down, as their assembly requires them to be fastened to the ground. 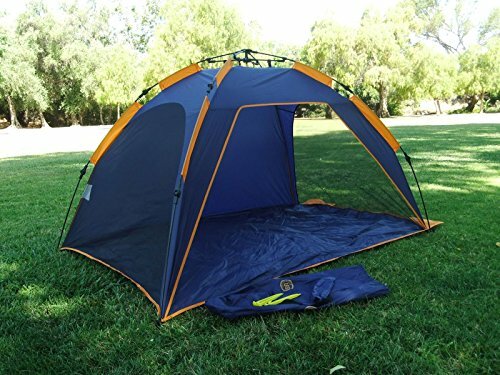 These tents are very water resistant, and the elongated shape makes them very comfortable to sleep in. There are a few other shapes, but these are the most common when it comes to camping tents for family trips or backpacking. The durability of any given tent is not in small part affected by the quality of the poles that are used to set them up. Most tents use aluminum poles as part of their setup, which are sturdy, flexible, durable, and only moderately heavy while remaining in the mid to high price range. The budget alternative when it comes to tent poles is the fiberglass variant, which are cheap, very sturdy, and resistant, with the big tradeoff being that they’re quite heavy, especially if you need to lug them around in your backpack. The most expensive, durable, and lightweight alternative is, by far, carbon fiber tent poles. If you can afford them, then this is the best option, though they are not as durable as aluminum. ​First off, you should that there are actually many different types of tents, most of which are oriented towards specific environmental conditions. Nature is not static, especially north of the equator, where we have the 4 different seasons. Consequently, most camping tents are built to weather specific environmental conditions, which can include those from a specific season, as well as multiple seasons packed into one versatile package. It pays to take what season you’re planning on camping on, as this factor can help you purchase the best tent for the occasion. One Season: As their name suggests, these types of tents are usually suited for a single season, specifically, summer. These tents are commonly very breathable, and are usually equipped with a rain fly right out of the box. However, the downside to these tents is, since they’re geared towards hotter, drier, and arid climes, they may offer a less than optimal waterproof rating, even with the rain fly installed. Before purchasing a one season tent, you will need to do some research on whether the place you’re planning on venturing into commonly experiences rainfall, or monsoons. Trust us when we say that a damp and soggy tent can really ruin anyone’s camping trip. Three Season: These tents are the all-rounders when it comes to versatility. They offer a vastly improved waterproof rating; at least when compared to the one season tents. Furthermore, three season tents are better insulated and equipped to handle the environmental conditions of spring through autumn. some of these tents can actually weather a bit of snowfall. For these reasons, these are the types of tents you may want to purchase if you plan on venturing forth into the wild in different seasons. However, those that are looking to camp out during the winter may want to invest in our next type of tent. Four Season: True to their name, these camping tents are the best options for year-round camping. However, they’re not necessarily the best choice, given that they can get very hot in humid or dry climes. Their superior insulation to the other types of tent comes with the unfortunate tradeoff of being less breathable than the alternatives. They are, however, built more sturdily to withstand the merciless elements. These tents will stay dry during the heaviest of downpours, and will never buckle under the weight of intense snowfalls. Expedition: These tents are the toughest and meanest camping shelters that money can buy. They are designed to withstand absolutely anything that nature can throw at it, including freezing hail, and intense sideways rain or snow. These tents are absolutely mandatory if you’re looking to venture into Antarctica, or to other places where the elements show no mercy, such as Mt. Everest. If you’re a casual camper or are a looking for a tent for relaxing family trips, then odds are that this is not the type you’ll need. Besides tents for different seasons, there are also a wide variety of tents for a similarly wide variety of conditions. Some, the seasons they are designed to withstand, these tents can come in different sizes, shapes, with a differing number of rooms, and with different setting mechanisms. Here are the most common types of tents available on the market. Instant Tents: Also called pop-up tents, these camping shelters are famous for their ease of setup. As their name suggests, these tents simply pop-up. They poles of these tents are weaved into the fabric itself and, with the use of a certain mechanism, they can be pitched in only a few minutes or even seconds if you’ve deployed them before. These tents are ideal for festivals tents or for kids who like to play tent in their backyards. They are not well-suited to withstand the might of the elements; due to their lightweight frame, they can be easily blown away by strong gusts. Furthermore, they can be troublesome to fold and store, especially if you haven’t done it before. Nevertheless, these tents are perfect due to their ease of use and compact shape. In this article, we will be focusing on these types of tents. Inflatable Tents: Like the pop-up tents above, inflatable tents are also famous for being easy to set up, as well as being able to deploy them in just a few minutes. These tents are granted their ruggedness and rigidity from tubes and beams which are filled with air from a pump and are kept taut while in use. Family Tents: More than a type of tent, family tents get their name from their size. These types of camping accommodations are geared for use by multiple individuals and are usually big enough to stand up in. Furthermore, they also offer multiple compartments and plenty of space to store your gear, as well as to comfortably sleep in. These tents are designed so that you can take in the beauty of nature, while also retaining - in a certain degree - the comforts of home. Backpacking Tents: These are some of the most niche types of tents in the market. They are geared specifically towards hikers and expeditioners that want to traverse into the wilderness, while also having a comfortable shelter in which they can catch some Z’s during the night. These tents are usually very lightweight, so they can be carried comfortably on the hiker’s back, and are meant to be deployed and dismantled several times in a single trip, so they are also simple to setup and take down. Festival Tents: These tents are not dissimilar to the instant tents mentioned above. The only difference is that these tents while being easy to pitch and take down, don’t always include a pop-up mechanism. Since these tents are specially designed for use in places where there is literally a sea of other tents (such as in during concerts or festivals), some may also come equipped with tracking devices which allow the user to easily spot their tent even through the darkness of night. Weekend Tents: These are some of the smallest tents you’ll find on the market. Most of them are designed for single-person use and leave little space for gear or other objects that are not the user himself. This tent comes in many shapes, but they are usually designed to accommodate only one person at a time. Face-to-Face Tents: Also called vis-á-vis, which is French for “face-to-face”. These camping tents usually consist of 2 large sleeping areas, connected in the middle by a “lobby” of sorts, which is usually a tube or dome large enough to stand in. The sleeping areas of these tents can be either tunnel, or domes. Tunnel Tents: Instead of featuring poles which cross at the roof, like many other tents, the tunnel variant has poles that run parallel to each other, and straight into the ground. The result is a tent which is less like a dome, and more akin to a hangar or tube. While the form factor of these tents can arguably provide better sleeping accommodations than regular dome tents, but the downside is that they always need to be pegged down, since their assembly depends on it. Dome Tents: Arguably one of the most common types of tents for hobbyist campers. These tents consist of poles that cross in the roof, forming a dome-shaped shelter which can withstand harsh winds and, with the use of a rain fly, torrential rains. However, the bigger models tend to be more unstable, as they usually sway around in the wind. Ridge Tents: These tents also consist of poles which cross at the roof, but instead of bending and forming a dome, like the ones mentioned above, the poles form an A shape. These are very easy to pitch, and are sturdier than other types of tents, with a significant tradeoff in portability and also the fact that they are also heavier than other types of tents. Beach Tents: These ones don’t actually offer any type of reliable shelter from the elements, with the notable exception being the sun’s UV rays. Beach tents are designed to provide a roof in which the user can sit beneath, and usually require little to no assembly in order to pitch it. These tents are usually set into the sand, with some fastening required in those particularly windy beaches. Some of them don’t offer a floor, so the user will have to set a tarp or towel underneath if the does not wish to sit directly on the sand. It goes without saying that these tents are not designed for overnight use, but rather for spending a pleasant afternoon at the beach. Right, now that we have a general idea of which type of tent we need to purchase for our camping trips, let’s go ahead and go over the best brand of manufacturers for these products. When it comes to tents - as well as pretty much anything else in shopping - investing in a good brand is almost always the best choice you can make. Despite sometimes having to shell out a couple extra bucks, good brands of products will ensure that you will receive exactly what you are paying for. When you invest in a good brand, you won’t be receiving any nasty surprises, such as faulty equipment or different products than what was specified on the box. Even if this were the case, most big brands usually employ awesome customer support agents which can help you sort out any issues you may have with your purchase. Based in New Jersey, USA, Pacific Breeze Products is a family-owned company that started off as a manufacturer and seller of easy to use, yet practical outdoor accessories. Their products are optimized for ease of setting up as well as for simplicity in dismantling. Furthermore, most of their products are lightweight and easy to lug around, which makes them perfect for family trips and other light camping activities. This Amazon-exclusive store counts with a 1-year warranty on all their products, which is backed by a staff of exceptional customer service agents. This company doesn’t really require any introduction when it comes to the world of camping, hiking, expeditioning, and other types of outdoor fun. Coleman is the industry leader in all things camping and outdoors, offering any and all types of products that any camper might ever need, whether they be a wilderness veteran or a weekend camper. Among their catalog of products, you will find the following: stoves, grills, coolers and jugs, furniture, outdoor games, lanterns and other sources of light, sleeping bags, replacement parts and, as we already know, tents of all shapes and sizes. Once a part of big corporations in the world of outdoors equipment, the folks at CORE broke out of their shells and established their own business deep in the heart of the American Midwest. Their mission is simple, to provide products aimed at enhancing the user’s enjoyment of the great outdoors. While there are many activities in which a nature lover can engage today, the fact remains that they should never be held back by their gear. In fact, it should be the other way around. The folks at CORE know this and are fully committed to creating and selling products that are as good, or better than those made by the big fish in the industry while trying to keep prices comparatively low. This is one of the smaller companies featured on our list. Their products are only exclusively available in major retailers (Sears, Walmart, etc), which means no website or other online portals by which you may learn more about their products. However, the guys at Genji manufacture some of the best camping equipment for campers on a budget. For a fraction of the cost of any product by other big brands, you could invest in a Genji tent and still have plenty of money left over to invest in other areas of your camping trip. We can’t say for sure if their products can actually stand the test of time, but, for what is little more than pocket change, you can buy yourself a Genji tent which can keep you sheltered during those afternoon trips to the local campsite. Despite the wide variety of tents available for purchase on the market, we believe that these are the very best picks in terms of price and performance. Of course, your experience may vary according to the variables of your trip. However, with our buying guide, coupled with our instant tent reviews, we sincerely hope that you are able to make the best purchase suited to your requirements.